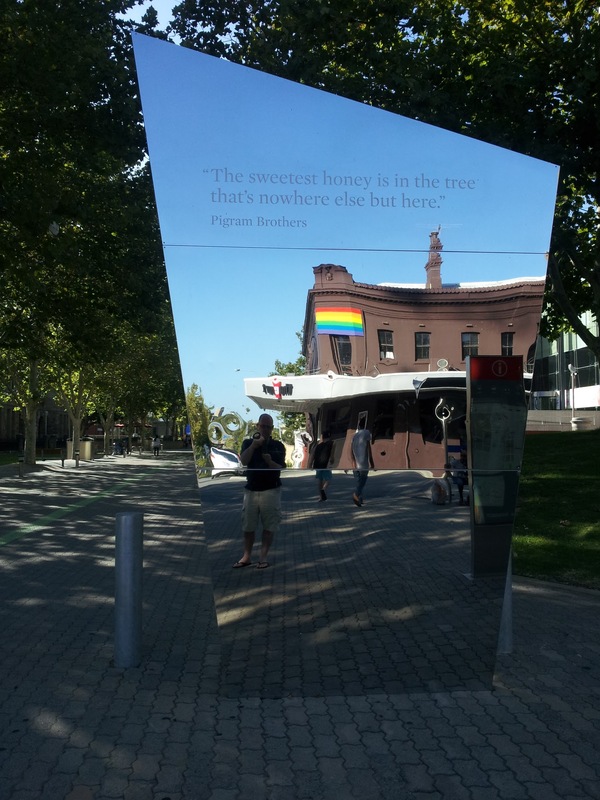 Public art, thoughtful words from the Pigram Brothers, and the perfect place to check your hair and make-up before heading to The Court Hotel in Perth, Western Australia. I took my first work-related phone call from the Eastern States at about seven o’clock this morning. Even though it was in my diary, and I’d planned for it, I was still fairly bleary eyed. Still, I think I managed to make sense of it all. I think I also made sense when I took a call the other day from The East where the person on the end of the phone hadn’t quite realised there was a three-hour time-zone difference between Melbourne and Perth. “So it’s 10.30 in the morning?” the person on the other end of the phone said, to which I replied, “No, it’s 4.30 in the morning”. Three hours time difference between Sydney and Perth shouldn’t make a difference but it does. And I was reminded tonight of why, at the end of 2004, I decided to return to Sydney, instead of staying in Perth: it’s the time-zone difference. On paper, you wouldn’t think two or three hours makes a difference, but it certainly does. The work stuff you can live with. That’s why you get the big bucks. But a three hour time zone gap makes the biggest difference when it comes to maintaining relationships with family and friends. You arrive home from work, and you think it would be terrific to ring up your family and friends, and then suddenly you realise they’re going to bed. Even though many of my friends back home are night owls, you still don’t want to call too late. And besides, there’s a difference between calling someone at seven and calling someone at ten. And that’s what happened after work today.